We accept all major credit cards, Visa, Visa Debit, MasterCard, American Express, Discover and we also accept Paypal. You can pay securely via our built in payment system, and at no time are your card details disclosed. We are PCI compliant and a member of Trustwave trusted commerce. You can view our seal of approval at the bottom of the page. Like our Facebook page to be kept up to date with competitions and give away's. It will also keep you in the loop for when new products arrive! 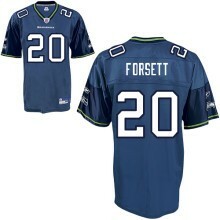 Reebok Seattle Seahawks Justin Forsett Blue Premier NFL Jersey. The high quality NFL Premier jersey is made of heavier fabric, with nylon diamond weave mesh. This team colored jersey showcases the embroidered NFL Equipment patch at the point on the v neck collar and a team specific jock tag at the lower left front above the hem. The officially licensed Premier jersey proudly displays the sewn on, single layer tackle twill team graphics at the chest, back and sleeves.